Looks like Fido and Virgin Mobile are offering up a promo plan exclusive to customers in Manitoba. 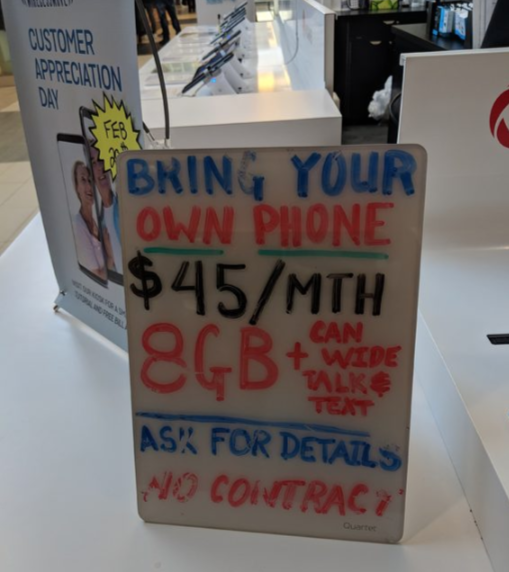 According to RFD, a Wireless Wave kiosk in Winnipeg is advertising a $45/8GB BYOD plan, which includes unlimited Canada-wide calling, unlimited international SMS/MMS, and the usual extras (caller ID, voicemail, etc). There is a free SIM card available, however a $35 activation fee applies. This plan is available for new or existing customers. For existing customers, you should be able to switch to this through online chat. According to one Fido user who just switched to this plan, the 8GB data is permanent and the $45 monthly rate does not go up after 12 months. You could try asking your local Fido store if you can get this plan in your province, but for now it seems exclusive to Manitoba.